When I headed for Southern California last autumn, I had a good idea what I was going to do: for work, visit an olive oil farm, do some research, and connect with some business associates, and for fun, attend my college reunion. One of things I hadn’t planned on was running across an incredible store for secondhand books. Bart’s Books dates to 1964. It bills itself as the world’s largest outdoor bookstore, though I find it hard to imagine it has too much competition in the “outdoor” category. 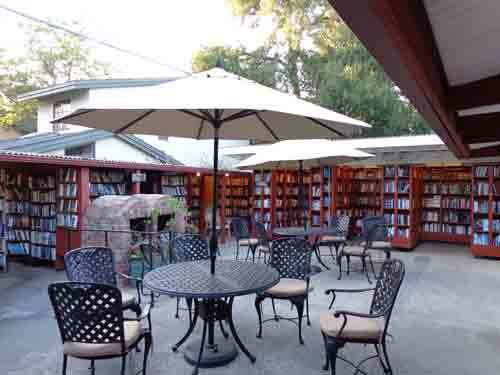 Bart’s has nearly a million books crammed into a maze of al fresco book shelves. Attractive seating areas with umbrellas for shade on sunny days and brick ovens for warmth when the weather turns chilly invite hanging around. The variety of titles is stunning. There is actually a small house at the center of the sprawling “store,” but even it is filled with books (cookbooks in the kitchen and dining room, of course). If you find yourself in Southern California, I encourage you to at least consider a side trip to Ojai–a charming, mountain-cradled town filled with artists and surrounded by orange, avocado, and olive orchards. And if you love books, then definitely seek out Bart’s Books. 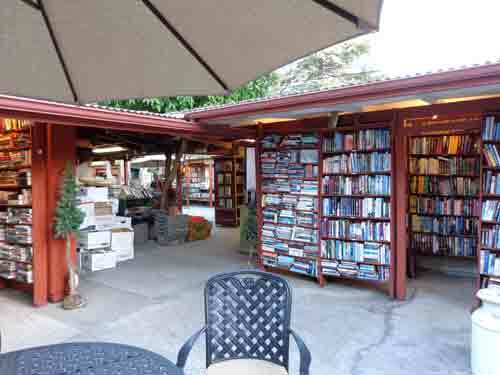 You never know what treasures you might find, but even if you find nothing you need, you will have been to one of only a handful of bookstores that might be considered destinations.